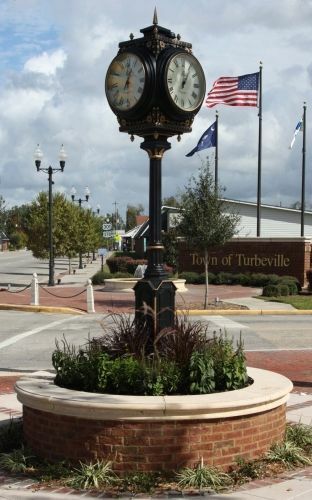 Known as “A Small Town with a Big Heart,” Turbeville is located in Clarendon County at the intersection of US 301 and 378. It has a long and interesting history stretching back to to 1840, when Michael Turbeville purchased 125 acres of land a mile north of present-day town limits. Michael Turbeville’s sons, William and Clem, eventually purchased approximately 200 acres near Michael’s land and built the first house in what is now known as the Town of Turbeville. The land the Turbeville brothers purchased was covered with large pine trees. Using this to their advantage, they built a successful turpentine still and business that lasted over 20 years. The community was known “Puddin’ Swamp” during this time. After the pine trees were tapped out and the business was no longer profitable, the brothers began operating a saw mill and cut and sold the timber. A railroad was built through the community, which further enhanced the Turbeville brothers’ profits. When the federal government established a post office here in 1898, the community became known as Turbeville.